Our Malagasy projects offer you the opportunity to make a lasting and tangible difference to the lives of the vulnerable Malagasy community. In return, our volunteers are provided with a once in a lifetime experience of living and working in the real Africa, meeting a variety of people from different backgrounds as well as gaining a unique opportunity to take a hands on role in conservation, rehabilitation and humanitarian work. Operating in the south-east of Madagascar, we offer wide range of sustainable development and conservation projects within the town of Fort Dauphin, as well as with numerous rural communities across the Anosy region. Alongside this, the team aims to raise global awareness of Madagascar’s unique needs and build constructive partnerships to aid development. Was amazing! Best 16 days of my life! It was incredible to work with such fantastic animals and it was an experience I will never forget! Thank you to everyone at Worldwide Experience. Projects include school building, health and environmental education, well and latrine construction and tree planting. Working with our superb team of local guides, construction team and other specialists, you’ll be involved in the day-to-day work of the organisation in town and in the bush. This is a 4-10 week program. This will typically include a combination of a school build project, conservation project and other type of community project such as a household survey or sanitation project. 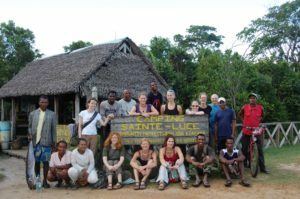 This programme is based in the rural village of Sainte Luce at the conservation campsite. There is not a guaranteed supply of electricity, accommodation is in tents and there are latrine-style toilets and bucket showers. 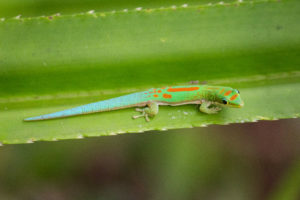 The conservation programme is based in the beautiful coastal region of Sainte Luce, surrounded by extremely rare and threatened fragments of littoral (coastal) forest, You will be combining hands-on conservation fieldwork on endangered species including lemurs, reptiles and amphibians, with community initiatives and environmental education. The programme runs in 2-week blocks which can be combined so individuals can volunteer for 2, 4, 6, 8 or 10 weeks. As a volunteer on this programme, you may work on community projects such as building schools or building wells and latrines in rural villages. 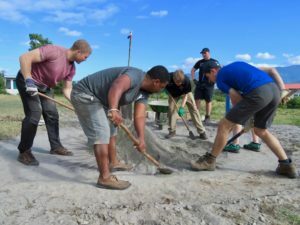 In a group of like-minded international volunteers, with a team of Malagasy guides and an international group co-ordinator, you may get involved in digging a schools foundation and the construction of the walls, all the way through to painting the classrooms and building the classroom furniture. Or you may work on health and sanitation projects building wells and latrines in areas with poor sanitation, increasing access to safe drinking water and educating about the importance of hygiene. All skills necessary to participate on the programme are taught during the placement so no pre-existing experience is required. 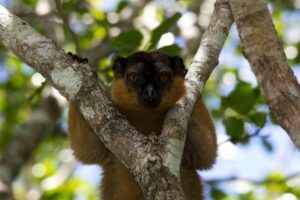 Conserving Madagascar is operated in the south-east of Madagascar, within the town of Fort Dauphin, as well as with numerous rural communities across the Anosy region. The conservation programme specifically is based in the beautiful coastal region of Sainte Luce, surrounded by extremely rare and threatened fragments of littoral (coastal) forest. You will be camping for the duration of your programme. Please bring a waterproof tent, preferably with ventilation (with integral insect screens in windows and doors). Please do not bring a one-man tent, you will be living in it for a few weeks and previous volunteers have felt that they are just too small. Ellipse-shaped tents tend to be the best. The Karrimor Beta, MSR Hubba Hubba, and Blacks Cygnus Constellation tents have all been recommended by past volunteers. You should be looking to spend approximately £80-£150 on a tent…any less (unless it is a sale) and it is likely to not be good quality. A sturdy groundsheet and tent repair kit (including duct tape) are also important to consider. If you do not have a tent of your own, you are able to rent a basic tent from SEED Madagascar for £50 for 1-4 weeks or £75 for 4 weeks+. Meals are provided, and will be simple, mainly consisting of rice and beans, supplemented with fresh fruit and vegetables when available. We encourage our volunteers to arrive at the airport in Fort Dauphin, where a SEED representative will meet you at the airport and transfer you to our volunteer site. SEED Madagascar can organise and provide support in booking transport and taxis on arrival in the capitol Antananarivo, but this must be paid for by you. SEED Madagascar will arrange and pay for all airport transfers on arrival from Fort Dauphin airport, other programme scheduled transfers to and from the SEED Madagascar base in Fort Dauphin and volunteering sites, during the programme. You are in a developing country where mobile reception and internet connections can be patchy. Plans change, days in town may turn into days in the bush. We advise that, whilst you can tell friends and family you will be in touch, do not promise to contact them at set times and on set days. They will only worry if you cannot contact them. If you wish, SEED Madagascar can call/e-mail a nominated friend or relative on your arrival in Madagascar to let them know you are safe. Purchase a Malagasy Sim card which costs around £1.50—text messages to the UK cost around 10p per message and calls cost 70p per minute. Our staff use the Telma network in Fort Dauphin. Volunteers have successfully used WhatsApp to message and call home. Internet Cafes are available in Fort Dauphin where you can access your personal email. The Madagascar climate is hot and sub-tropical, it is colder in the mountains, while the south and west regions are particularly dry. The island has a diverse interior with plateaus, volcanoes, forests and natural reserves. The wet season in Madagascar is also the hottest time of the year, with temperatures hitting a daily average maximum of 28º C (82º F) in December with a daily low of 17º C (63º F). July is the coolest month with daily average temperatures ranging between a 21º C (70º F) and 9º C (48º F). The daily temperature range averages around 8 º C (46º F) year-round. Beaches surround Fort Dauphin and they are all worth exploring. Ankoba beach is close to the office and is good for swimming. The best place for swimming is Libanona beach, 20 minutes walk from the office, although you may be hassled with people trying to sell their wares. Some beaches are well-used defecation sites and the team in Madagascar will ensure you are aware which ones so avoid swimming or surfing there, as faecal contamination is not unheard of. Nahampoana Reserve – private reserve close to our Lanirano Campsite – optional visit is offered at an extra cost (50000Ar) on most schedules. A great chance to get close up to Shifaka, Ringtail and Brown Collared lemurs. St. Luce and Evatra have beautiful beaches. They are both definitely worth a visit if they are not on your schedule. Talinjoo Hotel on the edge of town provides a boutique style luxury pool and restaurant for relaxation! Dancing – Panorama is a popular spot, complete with indoor toilets. Shopping – There are a few small shops in town to buy gifts and souvenirs. There is a ‘Maki’ brand souvenir shop that sells more commercial gifts such as branded t- shirts, sun hats and bags. There will also be people following you around town with their silver bracelets, shell necklaces, vanilla pods, baskets, spears and table cloths. Volunteers often spend time walking to local markets, relaxing with a book or playing card games. Villages usually have small local shops selling soft drinks, bottled water, beer, rum, soap, washing powder and biscuits. 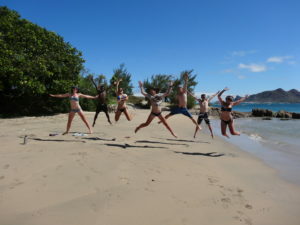 At the conservation camp in Sainte Luce free days are spent at the beautiful beach. Placements are designed for you to be independent, with a core volunteer role and some free time during which you are welcome to explore the local area. Please note that you are expected to act responsibly and take care of your own welfare at all times. With the help of our dedicated volunteers and staff, the foundation continues to work toward an improved Madagascar through the implementation of our four main volunteering programmes which respond to the direct needs of local communities. Free time is two days per week (which may or may not be over an actual weekend). Free time whilst based at Sainte Luce can be spent at the beautiful beaches a short walk from the campsite enjoying the beautiful surroundings.